Too many people take their garages for granted and don’t consider ways to improve them. 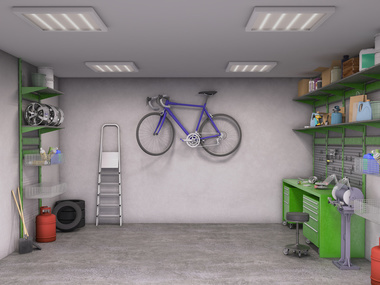 In fact, an updated garage can be a great place to store tools and other gadgets, making this oft-forgotten space a useful storage area. Whether you park your cars in the garage or just use it as a storage space or workspace, putting one of these garage improvements into action can improve, for a small price, the look of your garage. Epoxy-coated floors are the newest trend in garage improvements, and for good reason. An epoxy floor coating is one of the most durable and long-lasting ways to protect your garage floor. As an added bonus, the epoxy coating will completely cover up any blemishes or old oil stains on the original concrete floor. You can choose from a variety of colors, including solid shades and variations with colored flecks. You can pick from a wide range of color options … Perhaps the colors of your favorite sports team? This one is especially relevant if you use your garage as a storage space and not a parking area. Consider installing new shelves, hooks or drawers in order to organize some of the clutter and get things up off the floor. Some particularly handy homeowners might want to take this one step further and install a platform that can be lowered from the ceiling using a pulley system. This is an awesome way to really get the clutter out of sight, particularly if you have a high-ceilinged garage. Taking advantage of all of your garage’s usable space is one simple way to make it seem less cluttered. If you store bicycles in your garage, consider getting a wall-mounted bike rack. This will get your bicycles up and out of the way so that you have more floor space available. Many people complain about having to climb over and around their bicycles in order to reach other parts of the garage, and a wall-mounted bike rack is the perfect solution to this issue. If your family includes an avid gardener, consider converting one corner of your garage into a potting area. Set up a small workspace with a rack for garden tools and storage space for bags of soil, birdseed and, of course, empty pots waiting to be filled. Keeping everything easily accessible will make caring for the lawn and garden easier and less stressful. These four improvements are guaranteed to elevate your garage from forgotten room to essential part of your home.